The New Year has sure brought a few new and exciting things into my exchange: the ability to ever-so-gracefully fall down a snowy mountain (also known as skiing), a change in families, a different route to school (I haven’t gotten lost yet! ), the discovery of a couple cute cafés, and even the addition of an Australian to our motley crew of Košice-exchangers. 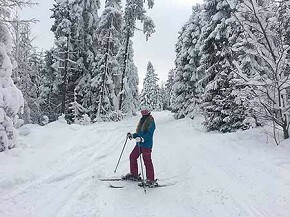 January began with a trip to the High Tatras with my first host family – they were excited to ski, but I was more concerned with getting off of the lift successfully and avoiding collisions with those who actually knew how to ski. We had crossed the northern border of Slovakia into Poland, so the familiar sound of “dobre” was suddenly transformed into “dobrze” and all confidence I had in understanding my surroundings was soon lost. It’s a good thing that skiing doesn’t involve much talking! We visited the touristic ski village of Zakopané, ate more cabbage, kielbasa, and mushrooms than usual, and of course skied a bit. Soon after we returned from our trip, it was my birthday! All day I received plenty of birthday wishes and then at home was surprised with a small family celebration. Not only was my first host family with me, but my second host family had also planned to come over and meet me for the first time; even though I was away from home, my host families helped make my day just as special. We ate cake (of course after I blew out some candles), sang birthday songs (in English and Slovak), and toasted with champagne (or Vinea for my host brothers). I will now have to get used to saying “mám devätnásť rokov” instead of “osemnásť” when people ask my age! Before I knew it, it was already time to begin packing up all of my things to move onto my next host family and I quickly realized how much I had acquired over the course of four months (sweaters, jackets, and boots for winter, stuff for skiing, Christmas/birthday gifts, and school textbooks that collect dust on my shelf). Luggage accumulated in the hall, which was then put into a car, then moved into a new house, and then a new bedroom. Now that I’m with a new family, of course many things are a bit different, but I am already seeing why Rotary has us switch families and believe that it makes exchange all the more interesting! This month has been bitter-sweet, but hard goodbyes have brought new opportunities, new challenges, new family, and new friends. The Australian students (who start and end their exchange-years in January) had to return home, which made for a rather solemn week of goodbyes – (I mean “see you soon’s”) – but also made our Rotary Winter Meeting in Poprad a much-needed reunion with all of the other Slovak exchange students. It was a weekend of taking Slovak language tests, hiking up mountains (and sledding down them! ), singing Slovak songs (“Opri sa o mňa”! ), and dancing to Brazilian ones! Though the end of the meeting meant that we all would have to say our temporary goodbyes and go back to our cities, the Košice group had something that made returning much easier, the arrival of a new exchange student – Finn! The past few weeks have been all about welcoming Finn to Košice – showing him where our favorite cafés are, which trams and buses to take, how to say things in Slovak, and where we have our weekly Rotary meeting – meanwhile, I’ve been getting settled into my new family. Just recently I even met some of my extended host family! Ice skating while trying to carry a conversation in Slovak is hard enough, never mind having to focus on skating (or should I say slipping)! It’s a good thing that I had my host aunt and uncle on either side of me, holding my hands and keeping this Floridian from falling on the fresh ice. That weekend we continued the winter sport trend by going skiing in the High Tatras, where I met even more family! – At this rate, I might have more family in Slovakia than I do in America pretty soon! Speaking of soon, there are so many things to look forward to heading into the second half of my exchange. There is a ples (ball) planned to start-off February, along with lots of skiing, and some Rotary výlety (trips) in the near future! I am full of excitement and ready for February!